Two of the stars of the Teen Mom franchise have teamed up and are currently touring the country– and The Ashley has all of the exclusive details! 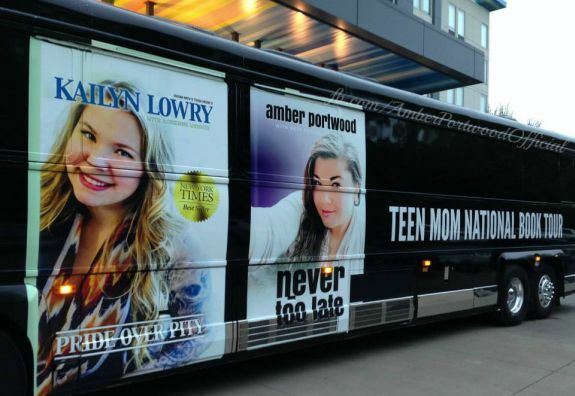 Teen Mom star Amber Portwood has joined forces with fellow author and franchise star Kail Lowry for a multi-state tour to promote their books, Never Too Late and Pride Over Pity. The girls will be making their way through the Southern states in a genuine tour bus, stopping at eight bookstores over five days to meet fans, take photos and sign copies of their book! Amber and Kail kicked off their book tour in Louisville today, and will be in Knoxville, Tennessee, tonight. Although they are traveling in their tour bus, the girls stay in hotels at night. This is only the second time that Kail and Amber have met each other, the first being at the “Ask the Moms” special taping in New York City in August. 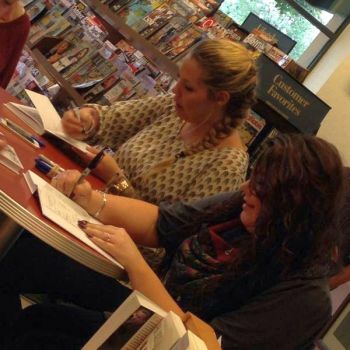 Kail and Amber at their book signing in Louisville on Friday. “I’m excited to work with her because, even though I didn’t know her prior to this, I watched the show and I can tell how much she has grown,” Kail told The Ashley. For more info on Amber’s book, Never Too Late, click here! For more info on Kail’s book, Pride Over Pity, click here! Amber’s book is not doing nearly as well as Kail’s did, but I think people are just over this whole teen mom thing. None of them are teen moms, they are now rich and famous so the original concept it not holding up anymore. It’s kind of staged and fake now, no one cares!